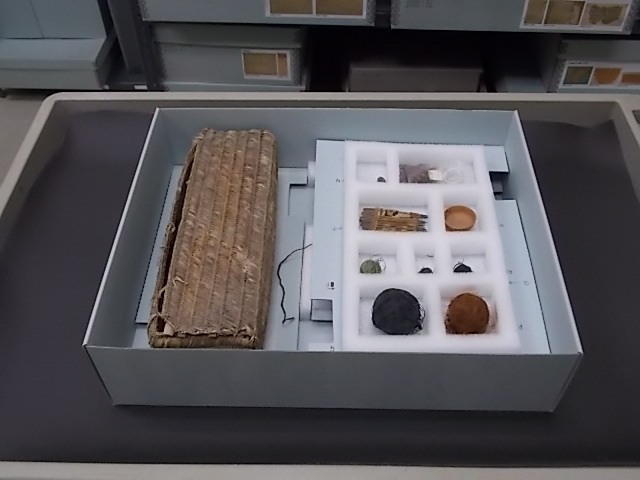 One of the great things about the climate of parts of the Andes is that many of their ancient textiles and textile tools have survived. 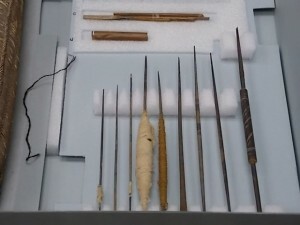 Archaeologists have even found whole looms set up with uncompleted textiles which may have been buried with their owners. 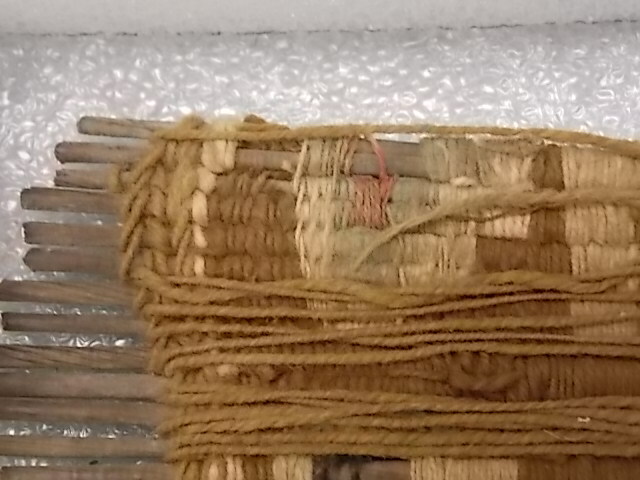 At the Carlos Museum, there are a number of artifacts which give us information about the tools weavers used and today I am going to explore one of them. 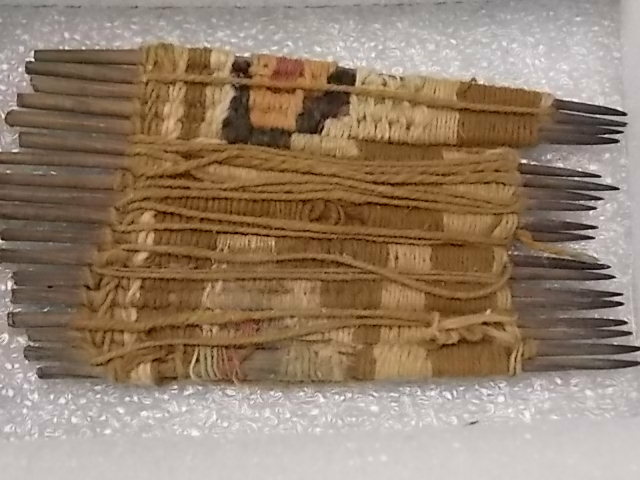 This is a basket which contains spinning and weaving tools from the Chancay culture which existed on the coast of Peru from 100-1470 CE, slightly overlapping the time period of the Wari culture. 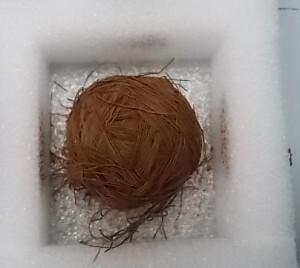 The basket itself is made of twined plant material, kind of like the wicker baskets we use today. 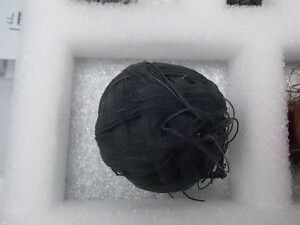 It was packed with everything a spinner could want as well as several balls of completed thread of different colors. 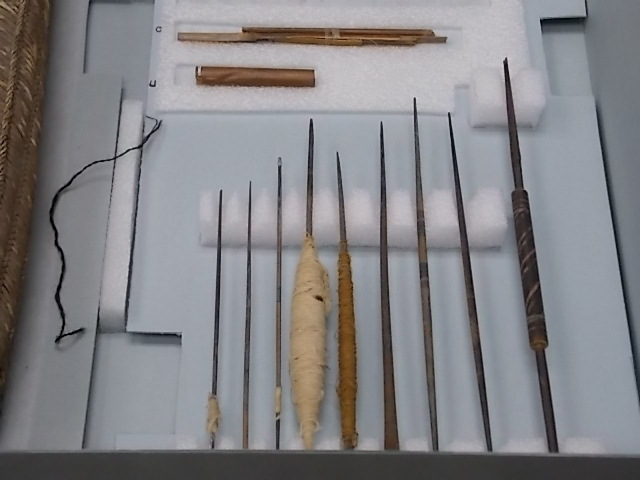 There were several spindles of various sizes, varying in thickness. Here you can see the 9 different spindles. One has quite a bit of white cotton thread still on it! The basket also contained a small clay bowl which would have been used to balance the spindle. 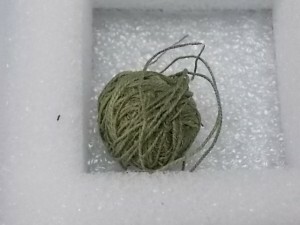 Cotton requires a different spinning technique than the one I am using in this project because has a much shorter staple and is subject to breaking. 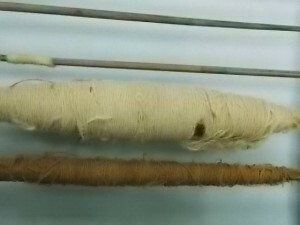 The weight of a drop spindle causes it to snap so cotton is often spun today in an almost identical manner, using a bowl to support a spindle with a sharp point. 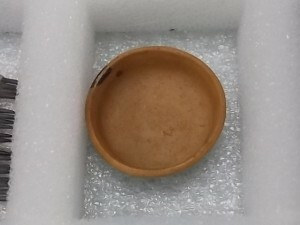 Here is a closeup of the bowl sitting inside its custom size spot in the storage tray. 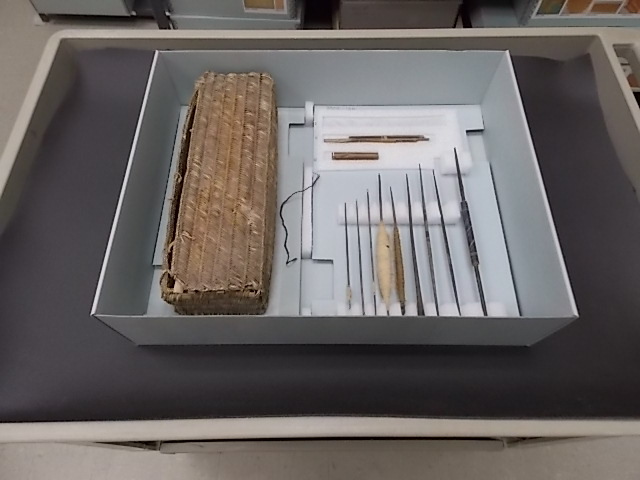 These two trays were made by the museum staff especially to fit this set of objects. This dark navy color would have been achieved with indigo dyes. 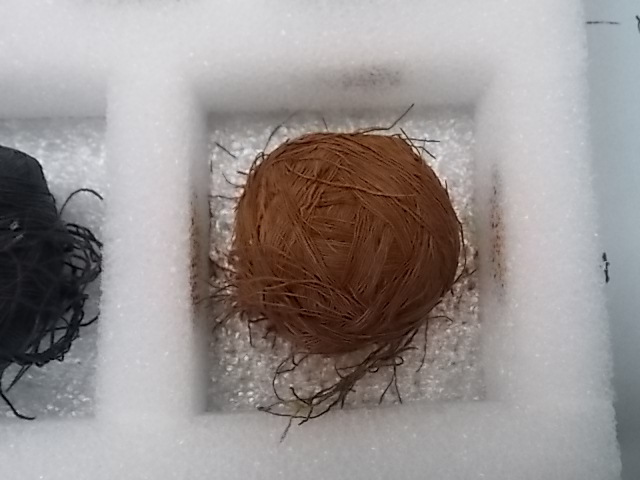 The darker the color, the more difficult it is to produce! 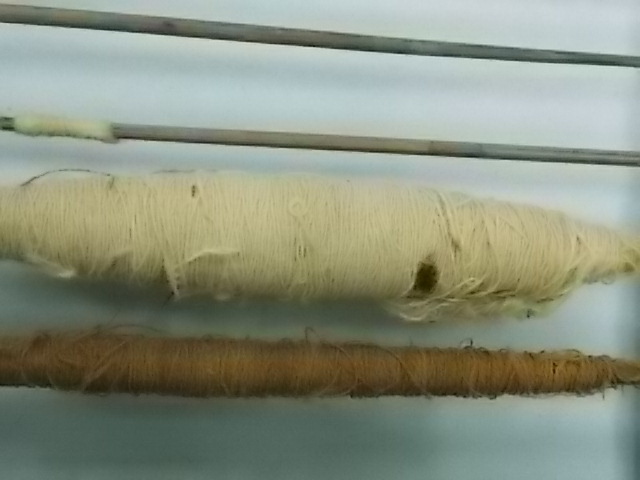 This thread is not as finely spun and you can see the twist of the two separate threads around each other. The final tool in the basket is a bit of a puzzle to me. It is an elaborately constructed comb made by twining threads around a series of pointed slender sticks. 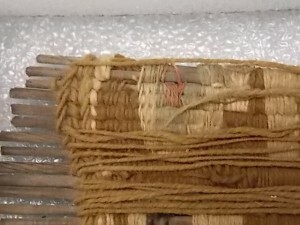 It could have either been used as a beater, or a tool to push down the weft threads on the loom to make a tighter cloth, or as a tool to comb apart cleaned fiber to prepare it for spinning. Let me know what you think!